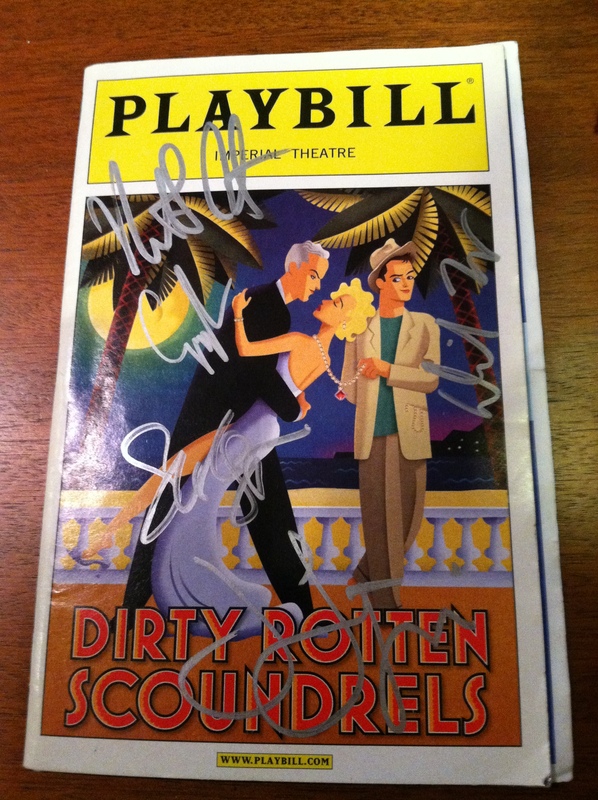 Here are a few things I didn’t know about Dirty Rotten Scoundrels. For one, the music and lyrics were written by David Yazbek, a man who bragged in his bio about writing the theme song to Where in the World is Carmen Sandiego? (Granted, I cannot blame him. It is a great song!) It was also the Broadway debut for writer Jeffrey Lane who is probably best known for his work on TV’s Mad About You and Ryan’s Hope. To date, he has only written the book for one other Broadway musical, 2010’s talent bomb Women on the Verge of a Nervous Breakdown. We caught a matinee of the show, and with one exception, we saw the original Broadway principal cast. Sara Gettelfinger was still in the cast, but she wasn’t playing the matinee that day. Principal actors who were not members of the original cast are in bold. Getting to see such amazing stage performers like Sherie Rene Scott (multiple Tony nominee), Joanna Gleason (Tony Award winner), and Gregory Jbara (future Tony Award winner for Billy Elliot) all together in one show was mind-blowing for me. I do enjoy the soundtrack too, and I still give it a listen from time to time. We didn’t get our Playbills signed at the stage door. Instead, we went to a signing at Tower Records on Thursday, June 23. 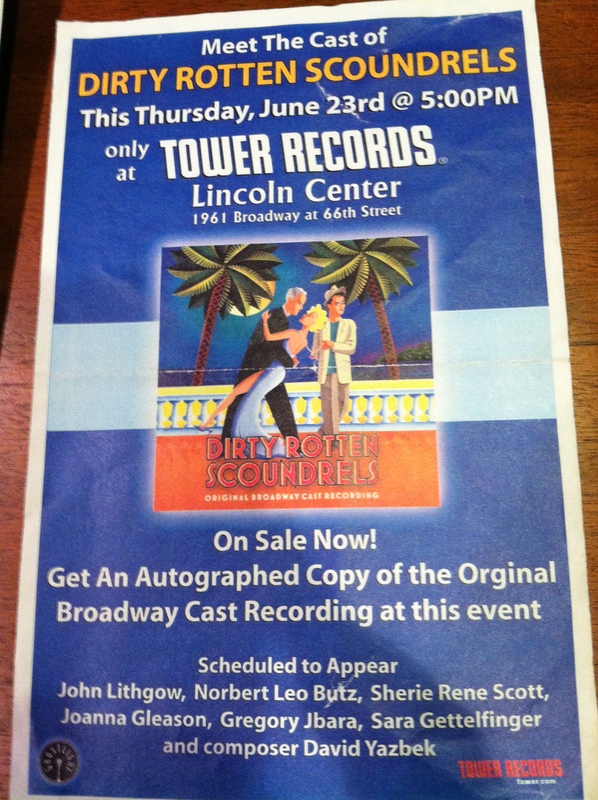 John Lithgow, Norbert Leo Butz, Sherie Rene Scott, Joanna Gleason, Gregory Jbara, Sara Gettelfinger, and David Yazbek were all scheduled to appear, but as you can see on the Playbill above, there are only 4 signatures. The Playbill was signed by John Lithgow, Norbert Leo Butz, Gregory Jbara, and Sara Gettelfinger, and a few of the cast members were nice enough to pose for pictures. 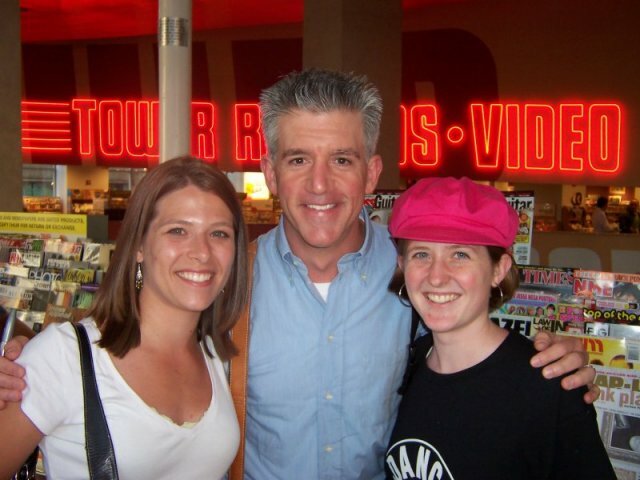 I have a picture of me with John Lithgow, which I promise to add when I find it, but I do have a picture of Sarah and me with Gregory Jbara. 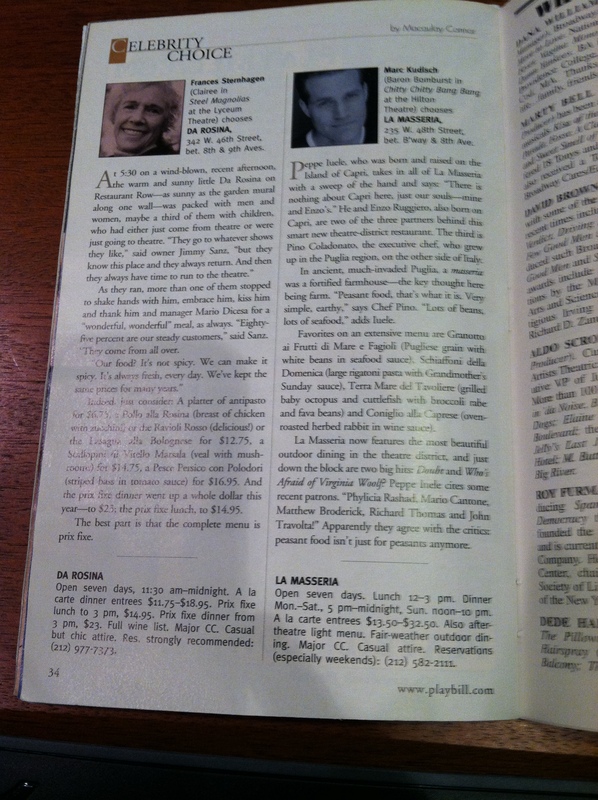 Inside the Playbill, it is the same news stories as last time, but I figured I’d share a few more pages from the inside. 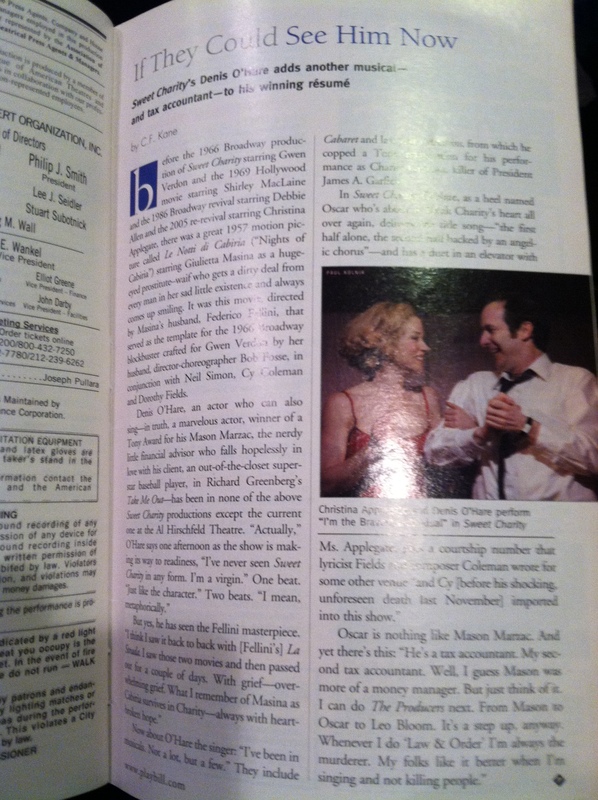 And another page about Sweet Charity with Christina Applegate and Denis O’Hare. Notable Shows on Broadway: A Streetcar Named Desire (Starring Natasha Richardson and John C. Reilly), After the Night and the Music, All Shook Up, Avenue Q, Beauty and the Beast, Brooklyn, Chicago, Chitty Chitty Bang Bang, Doubt, Fiddler on the Roof, Glengarry Glen Ross (Starring Alan Alda, Liev Schreiber, Frederick Weller, Tom Wopat, Gordon Clapp, and Jeffrey Tambor), Hairspray, Jackie Mason Freshly Squeezed, La Cage Aux Folles, Lennon, Little Women, Mamma Mia!, Movin’ Out, On Golden Pond (Starring James Earl Jones and Leslie Uggams), Rent, Spamalot, 25th Annual Putnam County Spelling Bee, Steel Magnolias, Sweet Charity, The Constant Wife, The Glass Menagerie (Starring Jessica Lange, Josh Lucas, Sarah Paulson, and Christian Slater), The Light in the Piazza, The Lion King, The Phantom of the Opera, The Pillowman (Starring Billy Crudup and Jeff Goldblum), The Producers, Who’s Afraid of Virginia Woolf? (Starring Kathleen Turner and Bill Irwin), and Wicked.